Dang. That's so clean I'm not entirely convinced it's real. Do I have this right? My XJ is goina be worth a million bucks in a few years!!!! Otherwise, if I cut up my XJ, it's going to be while fixing the rust on it, it's getting to be nearly like one of the XJ's owned by the author of that article. Speaking from recently buying an XJ, my 4th one. I can say that prices went up, and the "disposable hero" (as named by Four Wheeler magazine I think) isn't nearly as disposable as it used to be. The only cheap examples around here that are in good shape are 2WD models. 4WD models in good shape demand a premium. Like 7 to 10k premium for really clean models in some instances. The only 2,000 dollar models floating around unless you run into someone who doesn't know better are beat to hell, hacked up with a sawsall or full of rust or all of the above. Finding a stock in decent running shape 4WD XJ is like finding the golden ticket even before you get into cost. Its one of the reasons my most recent acquisition is staying mostly stock. That and if I'm being honest with myself a stock XJ with a lunchbox locker will do everything I've ever really wanted to do with a Jeep. The fact is, no one builds vehicles like the old XJ anymore. Or for that matter the old Blazers, Explorers, ect ect that used to run around. Nothing is a nice useable SUV anymore it's all swoopy crossovers anymore. And those of us that grew up in the 80s/90s and in some cases early 00s are to the point that they're looking for those older SUVs they grew up in that have a soul that nothing today can compare to. You got that right - search elsewhere on Jalopnik for "Project Swiss Cheese", a story of a $600 rustbucket XJ that went to Moab and took some very expensive Wranglers to school on the trails, it's a fun read. Capability to match/beat a CJ, with "night on the town"-grade looks? Who could ask for more? Fashion is fleeting, style is timeless. And the XJ, IMHO, has style. The guy who wrote this article is the same that owns the swiss cheese XJ, he's also done the trip in a Grand Wagoneer and early CJ, was planning on using a Postal DJ this time, but that isn't in as good of shape as Swiss Cheese though. I've cut up some nice ones in the past. I bought two super clean xj's in one day both for under $1000. Those days are long gone, I sold my lifted beat up 2 door with swapped axles and got a stock 4 door 5 speed with some decent options for a good price, needs some work but it's solid over all. I have no plans for major modifications on this one. I don't see the trend around here. I bought two cleanish (rust free) but almost 200,000 miles XJ's each with minor fixable issues for under $750 each in the last couple years... and see lots of college kids driving nice ones around as cheap daily drivers here in Montana. 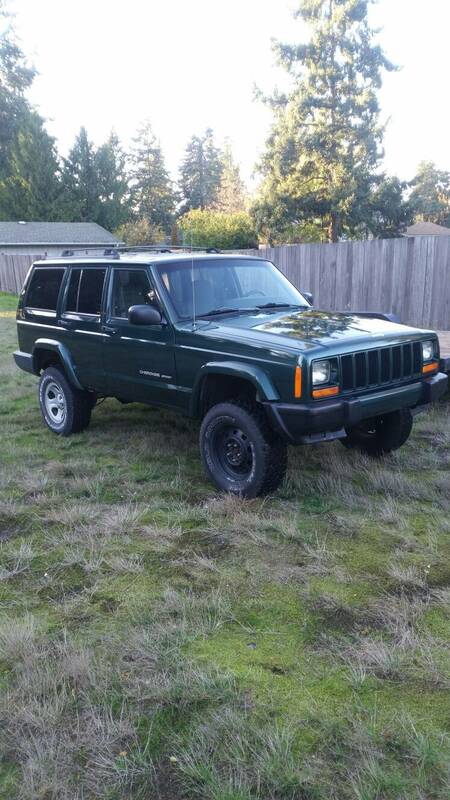 I know interest in the XJ is on the upswing because I keep getting offers for my stock 96. Starting about two years ago people were leaving notes on it, or asking in person. Nostalgia is worth big bucks. That's the most clean-looking XJ I've seen! Boy if he ain't got a high opinion of his internet ramblings. Aside from a sagging headliner and rear leafs my '99 is in primo condition. No rust, and the engine is still strong at 210K. I guess it might be time to fix the few things that need attention just in case I suddenly get the urge or need to offload it.